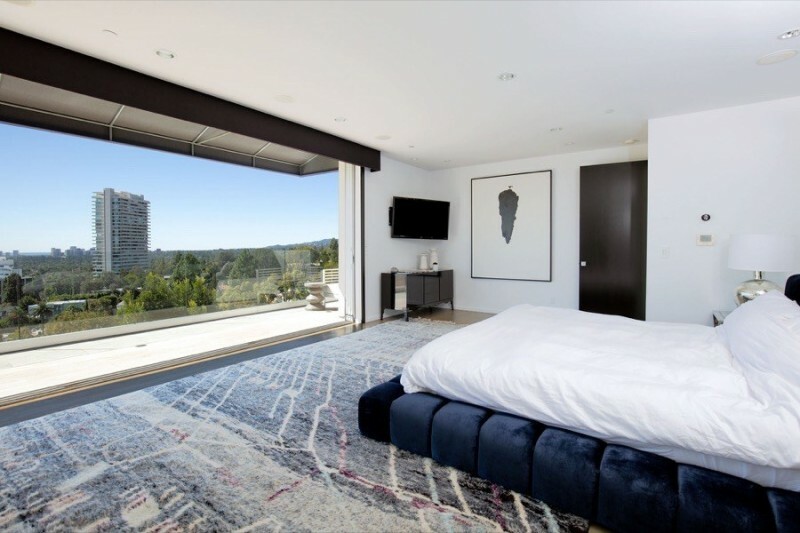 Singer-turned-actor Harry Styles picked up this modern home in Hollywood Hills West back in 2016, paying $6.87 million, but it wasn’t long before it appeared on the open market again. In the spring of 2017, Styles put it up for sale with an ask of $8.495 million. No buyer stepped forward with an offer, and in February of this year the property came down to $8 million. Make that $7.5 million. Now we’re in the ballpark, and the home’s consolations can shine through. Fleetwood doors, artful bamboo privacy landscaping, good million-dollar views of downtown L.A., and a stridently modern exterior will all help sell the home. With over 4,400 square feet of living space across three floors, the house has a fairly compartmental feel. It’s an early modern, dating to 1946, although renovations have left it with a very contemporary feel. The interiors are now understated and a little moody, with heavy contrast between the off-white walls, ceilings and floors with grey, dark brown, or black accents. Highlights of the four-bed, five-bath home include the combination kitchen, dining, and family room, which opens onto an outdoor living area with lovely city views; the master suite is also very fine, with a master bath that works with dark tile and bleached hardwood, and a private balcony accessible through retractable glass. Styles’ role in last year’s ‘Dunkirk’ gave the One Direction alum a new direction, which he’s in no hurry to take. His concert tour as a leader wrapped up in July of this year after a critically acclaimed run.